Apply for ArtSeed Internship/Staff Position Track! ArtSeed is looking for someone with strong administrative, organizational, and communication skills who wants to gain administrative and program experience working for a fast paced and passionate nonprofit. The internship start date would be March 1, 2014 and would involve training/orientation with ArtSeed’s current Program Coordinator to gain insights into ArtSeed’s outreach communities and develop an understanding of current program and administrative needs. By June 1, 2014 ArtSeed hopes to promote this intern to a 30/week payroll position with health insurance. Remuneration is modest but the rewards, (making a difference in the lives of disadvantaged children through art projects) are great! Send cover letter, resume and contact information for two references to Josefa Vaughan, Founding Artist and Executive Director, Office Phone: 415-409-1761, Cell: 415-656-9849, Email: josefa@artseed.org. 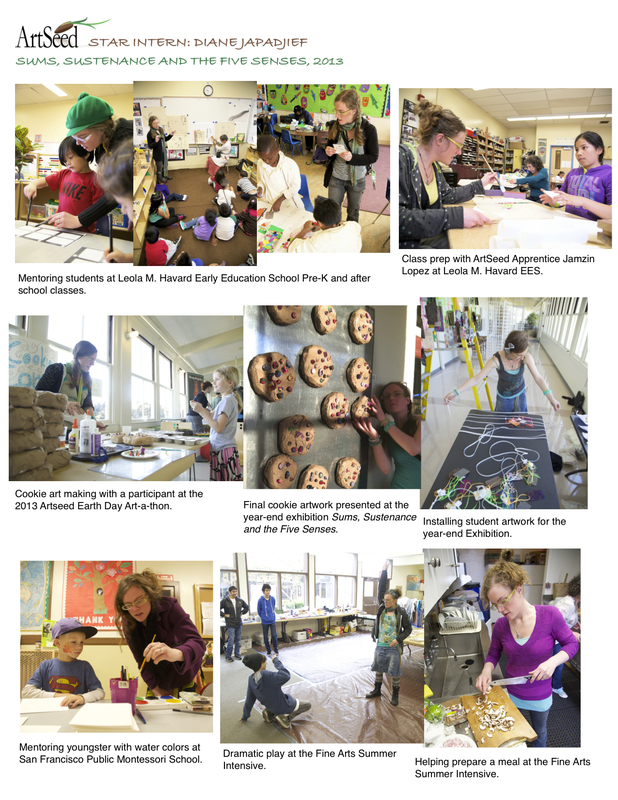 Highlights from 2012-2013 ArtSeed Star Intern Diane Japadjief.